Jonathan Wathen Phipps was appointed eye-surgeon to George III in 1796 and became a life-long confidant of three of the King's sons: George, William, and Ernest. As a friend he watched over Ernest, Duke of Cumberland, after an assassination attempt, held the hand of George IV as he died, and warned William IV that he risked succumbing to madness like his father. Wathen was also a trusted go-between - enabling Ernest, when King of Hanover, to keep in touch with his "secret" daughter, the product of a clandestine love affair which lasted twenty years. In 1809 Wathen's first wife died, leaving him with four small children. Three years later he married Lady Howe, a Baroness in her own right. His friend the Prince Regent soon sanctioned a change to his surname and conferred on him a baronetcy. 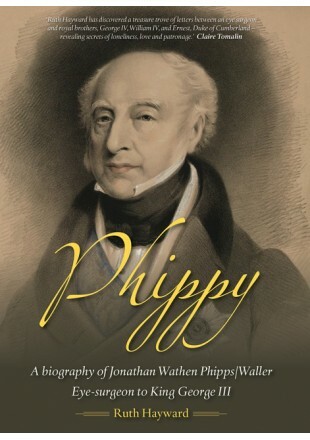 Plain Mr Phipps had become Sir (Jonathan) Wathen Waller. He took up residence in a newly-built Thames-side mansion, Pope's Villa in Twickenham, which he furnished sumptuously in the fashionable French style. There he hosted lavish celebrations to entertain his royal guests. Confidential royal and family letters (recently discovered in the Waller Collection at the Warwickshire County Record Office) provide an authentic glimpse of both court and private life from 1790 to 1850 - a dual perspective on the social history of the period. While Wathen moved in royal circles, his four children were minor gentry. Through intimate first-hand accounts of their day-to-day preoccupations - births, marriages, deaths, joys and anxieties - we can eavesdrop on their lives. Wathen's daughters married into Somerset families, the Jarretts of Camerton and the Langford-Sainsburys of Beckington, while his sons, a diplomat and a clergyman, married into the Wise family of Warwickshire (descendants of Henry Wise of The Priory, Warwick). In the next generation the family inherited the Wise estate at Leek Wootton, and became known as the Wallers of Woodcote.